Welcome back to the devblogs for Battlefleet Gothic: Armada 2. Today we’re providing a brief descriptor of every faction in the game, as well as showcasing one of their ships in screenshot or video form, and an in-game portrait from that faction. There are many more ships and portraits in the final game, of course, so this is just a quick taster of each faction’s lore and looks. The Imperial Navy boasts a vast array of ship classes and a great variety of tonnage, offering balance and a versatility to any fleet. Its ships are resilient, move at average speed and shoot at medium range. Adeptus Astartes vessels are expensive and therefore few in number. However, they are swift, mobile and offer substantial firepower. Space Marines are renowned for dealing ferocious damage during boarding actions or by conducting surgical teleport strikes on critical sections of enemy ships. In addition, the Space Marines' training renders them entirely immune to morale effects. The Adeptus Mechanicus field ships that are every iota as efficient as those of the Imperial Navy - further augmented by the most advanced technology at the Imperium's disposal. Their fleets are oftenly led by an Ark Mechanicus, a specialised battleship unique to the Adepts of Mars. The Adeptus Mechanicus prefer to engage the foe at a distance, and make extensive use of nova cannons and macro batteries. Like their masters, the ships of the Chaos fleet were once loyal to the Emperor of Mankind. But the corrupting influence of the Dark Gods has warped them into something fouler, and more dangerous. Now, imbued with hellish energy, they come to take revenge on an Imperium they once served. The Chaos fleet offers a wide variety of ships spread across a great range of tonnage, allowing it to muster a force suitable for any engagement. Its vessels favour swiftness and long-range engagement. Aeldari craftworlds are cosmic lifeboats, the last remnant of a star-flung civilisation all-but consumed by its own hubris. Forever teetering on the brink of annihilation, the craftworlders fight to defend their existence with ancient technology and the power of prophecy. Aeldari Craftworlders fight from swift vessels that favour hit-and-run strategies over sustained engagement, often using the cover of gas fields to shield their approach. Though more heavily armoured than other aeldari vessels, craftworlder ships are fragile compared to those of other races and demand careful manoeuvre to achieve victory. Aeldari Corsairs fight from highly advanced spacecraft that are lighter and faster than comparable vessels, but are also much more delicate. As such, their vessels rely on the extreme speed offered by their solar sails to avoid incoming fire, rather than on the ability of armour to absorb it. A drukhari fleet is a collection of swift, deadly raiders crammed with advanced technology that puts Imperial equipment to shame. Concealed by shadow fields, drukhari vessels ambush unsuspecting victims to unleash barrages of lethally sophisticated weaponry and launching remorseless boarding parties before their target has chance to react. Ork ships are rusty, ramshackle, and assembled from whatever parts the mekboy had to hand rather than a grand design. Nonetheless, they are every bit as potent as any ships used by other races. Orks offer little threat at long range but are festooned with heavy guns and grow increasingly dangerous as they close the distance. Moreover, the "Big Red Button" offers the prospect of heavy ramming damage to anyone foolish enough to be caught in their path. Ageless masters of the galaxy, the necrons emerge from stasis tombs to reclaim worlds lost to the ravages of time and the encroachment of lesser races. Coldly regal and slow to acknowledge outsiders as beings worthy of survival, the necrons will sweep aside all in their path in their quest to restore lost glories. Necron warships are costly, and often outnumbered. However, their living metal hulls are heavily armoured and capable regenerating damage even in the heart of battle. Mastery of Gauss technology lends their weaponry extreme precision, allowing the necrons to inflict crippling damage on an unprepared foe. Tyranids exist only to feed, to reduce living matter into thick, nutrient-rich gruel to sustain the hive fleet in its nomadic voyage across the stars. There is no common cause to be struck; no negotiation to be attempted. You either fight the Great Devourer until you can fight no more, or yield to its hunger. Tyranid bio-ships are numerous, fast, and expendable. Few individual vessels pose a substantial threat, but when arrayed in overwhelming numbers they are almost impossible to defeat through conventional tactics. Tyranid vessels are at their most dangerous at close range, where they can devour enemy ships whole. The foe's only hope is to take advantage of their weak armour as they close, because once the feeding begins, nothing can stop them. The Protection fleet, known as the Kor'or'vesh in the Tau language, was a purposeful extension and overhaul of the Tau Empire's merchant fleet. As the Tau Empire expanded, the increasing scope and scale of threats to the Greater Good demanded that dedicated warships be created, lest the Tau be overwhelmed, and their noble conquest throttled by selfish aliens. The Protection Fleet is composed of well-equipped, high-efficiency ships capable of devastating long-range engagements. However, their relative fragility and lack of speed make these ships vulnerable to swifter, more resilient foes. In the early days of their space-borne expansion, the Tau made little distinction between trade and conquest, for both offered opportunity. The heavily-armed and armoured trading vessels served them well in early conflicts, blazing a trail of expansion that has never since guttered. The Tau Merchant Fleet is composed of very few, slow, and well-equipped vessels. Each is equally capable of destroying the foe at a variety of ranges, relying on their formidable shields to keep the vessel intact while barrages of ordnance and torpedoes reduce the enemy to ruin. Battlefleet Gothic: Armada 2 releases on Steam 24 January 2019. You can already pre-order for Beta Access early December, and a 10% discount! My Space Wolves are ready to sail the sea of stars and bring death to the enemies of humanity and the Allfather. For Russ! Awesome write-up, but it did leave me with a question. Which Tau race gets the auxillary forces? And are there any new auxillary forces, or just the returning Kroot, Demiurg and Nicassar ships? Thank you, beautiful art. As always. I think the tau protector fleet screenshot shows a merchant fleet ship. I approve of only showing screenshots with tau getting eaten by nids though. You've got a better eye than me, because the ships in both the Protector Fleet and Merchant Fleet look identical to me. That's why I'm hoping there's more difference than "one has better armour than the other", or the may as well just combine the two. the merchant fleet is supposed to be broadside-based with cheap carriers and extremly bad boarding and is very slow moving overall, while the protector fleet will probably keep better prow armor, forward facing guns, gravitic hook escorts and the custodian as a super carrier while being faster overall. Ah, I misread your other post, deeeerp. That makes sense (Though weird of them to post it the wrong info). Still makes me wonder (Well, hope) that the Auxillaries all go to the Merchant Fleet, to well and truly separate them from the "core" Tau Protector fleet... Oh well, dare to dream! So, can someone from Tindalos/Focus Home Interactive maybe answer a few questions? What are the primary differences between the Corsairs, Craftworlders and Dark Eldar? Do those three use different ships from one another? Do the T'au Protector and Merchant fleet use different ships from one another? Who gets the Auxiliaries for the T'au? I have a question as well, so include me in there: the necron character is referred to as the right hand of another if said individual is the phaeron, is he the Grand Vizier or Maktlan, as those are two very different roles. 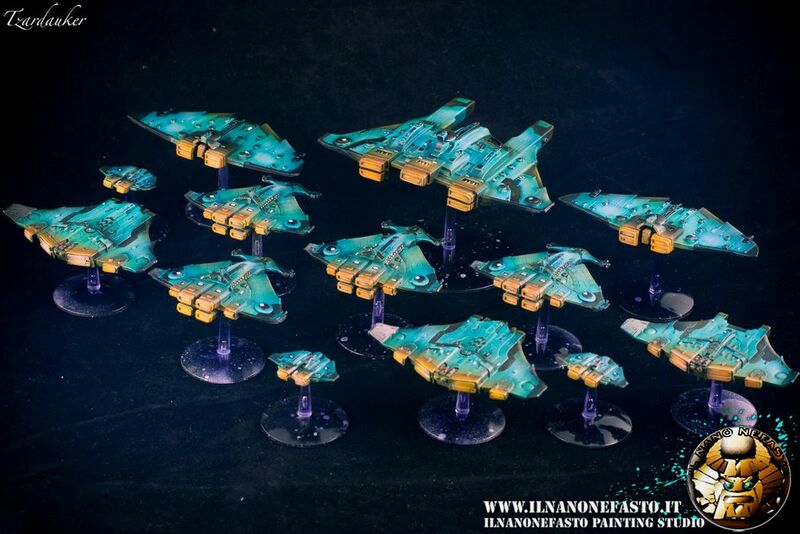 If you look closely to eldar corsair pics it appears that eldar ships will have wider firing arcs. which will make it easier playing hit and run. Good one devs. @romeo I think there will be little difference in playstyle for eldar races. The abilities are obviously gonna be different which might give a slight difference in play but they are all gonna ultimately be hit and run fleets. But I think you know that. I think the drukhari and eldar are getting a few new ships though. It looks like Adeptus mechanicus will play similarly to chaos fleets albeit slower probably more costly but stronger ranged damage. Certainly not a person from tindalos but I've been following every little piece of information that been released . No, I've been pouring over it all too, but there's still too many details that we're all just guessing at, rather than having them be laid to rest by Tindalos. That's why I'm kinda hoping for some concrete "here's x, y and z for these guys, which is how we've separated from these dudes' a, b and c". there was an eldar upgrade in the first game to have 180 degree macro firing arcs for a limited amount of time. @fosil ah ok. I think it should be perminent since now fleets can only choose from 2 upgrades.